Accuhorsemat, the innovative equine acupressure blanket, is wrapping up its sponsorship of the Amateur Jumper Division in the Equestrian Sport Production (ESP) Spring and Summer Series at the Palm Beach International Equestrian Center in Wellington, Florida. Riders enjoyed the season of competition while learning about Accuhorsemat, a non-invasive acupressure horse blanket that promotes healthy circulation and recovery through increased blood flow, toxin release, and muscle relaxation. Fifteen-year-old Elizabeth Flavell rode her nine-year-old Warmblood gelding, Hello, to the spring circuit Accuhorsemat Amateur Jumper Division championship title. “The spring courses were their first real horse shows together and they did amazing,” said Erica Garcia, Flavell’s trainer. “Elizabeth started in the Low Children’s Jumpers and then moved up. They made a lot of progress in a short amount of time.” Flavell won seven classes in a row at the ESP circuit on the gelding, whom she purchased in October of 2015. Flavell and her trainer Garcia are based out of Competition Farm in Southwest Ranches, Florida. 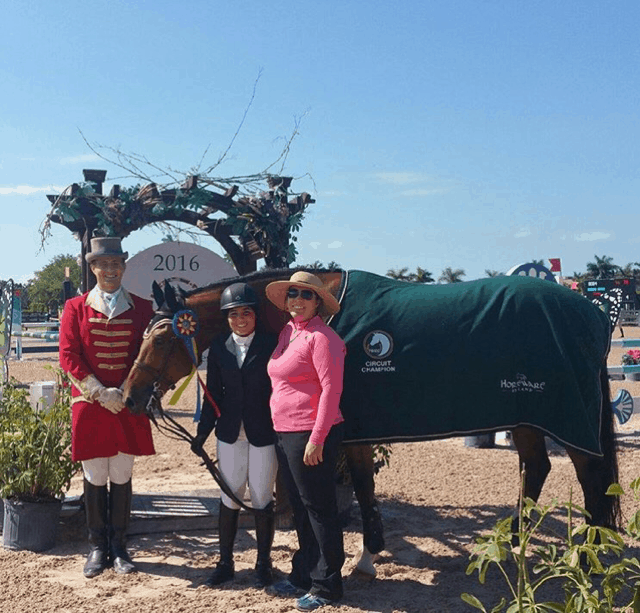 Another Accuhorsemat Amateur Jumper Division winner, Isabel Sánchez, rode Chino, a 13-year-old Warmblood from Argentina owned by Anabell Mejia, to a series of victories in the ESP Spring and Summer Series. Isabel Sánchez has been working with Chino since early 2015, and this was her third year competing in the ESP Spring and Summer Series. “The spring circuit is a very active competition, but more relaxed than WEF (the Winter Equestrian Festival in Wellington), which makes it more comfortable and friendly,” said Sánchez. “However, there are still many outstanding riders and you need to be strong and sharp to succeed. You must have the proper physical and mental preparation.” Accuhorsemat was pleased to reward Sánchez for her own preparation, which paid off so well in the company’s sponsored division. To help horses always enter the show ring prepared to win, Accuhorsemat blankets provide a variety of healing and therapeutic benefits. Accuhorsemat was developed in Sweden to address the needs of performance horses experiencing challenges with stiffness and recovery after showing or training. Acuswede, the North American distributor of Accuhorsemat, brings the healing properties of acupressure to competitive equestrians in North America. Top competitors know that a mentally and physically prepared horse is a secret to success, and Accuhorsemat blankets can help trainers and riders achieve this in their horses. The Accuhorsemat stimulates key acupressure points across a horse’s body to release tension in connective tissue, allowing for more mobility and pain relief. The Accuhorsemat has added benefits of helping loosen a horse before exercise and calming an anxious horse. Post workout, it helps sooth tired muscles. To learn more about Acuswede and the equine and human products it provides, visit www.acuswede.com or find Accuhorsemat at a horse show near you. You can also follow Acuswede on Facebook and Instagram. Photo: Elizabeth Favell and her horse Hello won the Accuhorsemat sponsored Jumper division at Equestrian Sport Production Spring/Summer show series in Wellington, FL (photo courtsey of Competition Farm).